I always knew that Guyana had beautiful women. 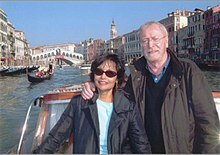 After all we produced Shakira (Baksh) Caine, the wife of Sir Michael Caine, the well-known British actor. Let me tell you a little story – all true. When I came to Canada in July 1967 I was President of Guyana Jaycees. I returned home in August to tie up some loose ends. The Guyana Jaycees were at that time running the Miss Guyana Contest. ……. I was asked to be a judge in the contest. I do not recall how many contestants there were but I chose Shakira as did the majority of the judges – I believe there were three or five judges. She was crowned Miss Guyana and represented Guyana at the Miss World Contest in London that year where she placed third. She remained in London to follow a modelling career. Michael Caine saw her in a Maxwell House coffee commercial and vowed that she was the most beautiful woman he had ever seen. He had been married before in 1956 but that marriage had ended in divorce in 1962. Caine got Shakira’s telephone number and called her every day for ten days before she agreed to meet him. They were married in January 1973 and have one daughter. ‘Take three, got it’. He’s just on the money…. He doesn’t ‘f’ around because he wants to get back to cricket”. Michael Caine and his wife Shakira”. The woman turned up her nose and said: “I am talking about people who own property on Gloucester Square. Not of those who rent”. Although Michael Caine was already an international star, he had not yet attained his greatest success. That came in the 1980s and beyond. Today – we would (or used to when I was growing up) say in Guyana, ‘he could kick that woman and pay for her’.